Yesterday or so, I stumbled across two very entertaining but rather eerie websites. But before I tell you what they are, I'm going to recommend installing the Greedy Cache add-on in your Pale Moon web browser. Preferably Pale Moon 27 (I use a version of Pale Moon 27.4.1 which I compiled myself), since it seems version 1.2.0 of the add-on isn't as reliable in Pale Moon 28.3.1, or at least not in the version of New Moon 28.3.1 which I compiled myself. Sometimes when I tried to save an image while using New Moon 28.3.1 + Greedy Cache 1.2.0, it seemed to download a new image from the internet instead of saving the one already in my browser cache. Addition, Feb. 22, 2019, 5:04 PM EDT. Actually, perhaps the above problem was simply because I may have accidentally opened the same web page in multiple tabs. If I do that, then, no matter which version of Pale Moon + Greedy Cache 1.2.0 I run, only the most recently-downloaded image gets saved, which can be different from the one on screen. So, perhaps either Pale Moon 27 + Greedy Cache 1.2.0, or Pale Moon 28 + Greedy Cache 1.2.0, will be fine, as long as you don't load the same web page in multiple tabs. Once you install the add-on, go to the Tools menu, choose Add-Ons, click the Extensions tab, click the Preferences button under the Greedy Cache add-on, and make sure the "Load resources from cache" and "Enforce caching of images" checkboxes are checked. Then restart your web browser. With that add-on installed in Pale Moon, hopefully you'll be well-prepared to save any interesting randomly-generated images that come up. Without the Greedy Cache add-on, you might accidentally end up saving a different image than the one shown in your browser. Addition, Feb. 22, 2019, 5:28 PM EDT. Also, even with the Greedy Cache add-on, there are a couple things you shouldn't do unless you use Pale Moon's "Work Offline" feature. To avoid having your browser mistakenly download a new image, go to the File menu and make sure there's a checkmark beside the "Work Offline" menu item before you right-click on the image and choose "View Background Image", or before you go to the "Tools" menu, choose "Page Info", and click on the "Media" tab. In a way, the cat website is even more disturbing, since that one generates scary-looking (though sometimes humorous) glitches much more often. ThisPersonDoesNotExist.com is particularly amazing, though sometimes there are scary-looking glitches with side-people, and backgrounds often look weird, earrings are often mismatched, and sometimes each eye is oddly looking in different directions. Here are my 2 favorite fictional people so far. You can click the below images for a larger version. Quite fun and amazingly impressive. But those websites also make it even more obvious than it already was that stuff on the internet, digital pictures, etc. shouldn't be mindlessly trusted, even if they seem incredibly realistic. I very rarely bother to make visual art, but, today, I made a painting using a demo of the software ArtRage Starter Edition 2.5, which is quite easy to use and fun. No title. I guess it looks better in the thumbnail than full-size. I didn't put much effort into it, and it was done with a ball mouse, not any kind of fancy computer art equipment. It took less than 15-20 minutes. 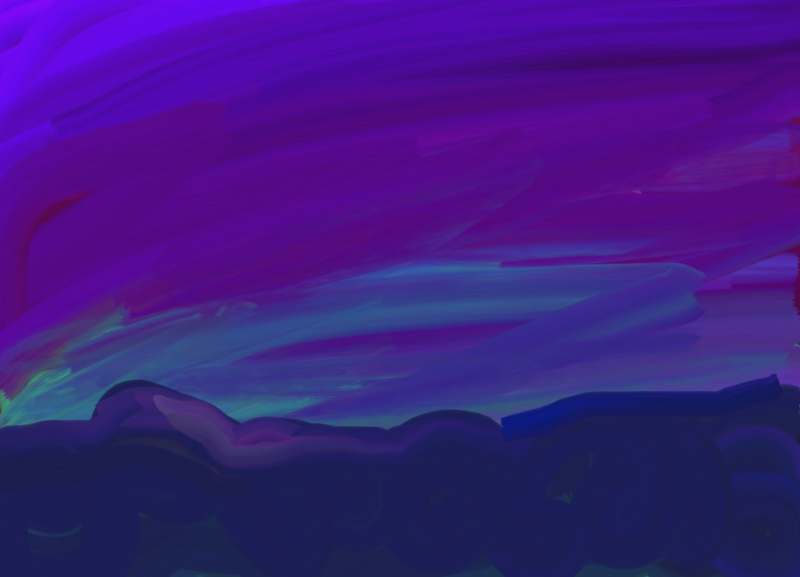 I didn't start with anything in mind that I was trying to depict, but, I guess it turned out like a landscape with a colorful sky overhead. I keep my computer monitor tinted with extra red, and didn't bother to untint it while painting, so, apologies if the colors don't look so great on your screen. My art tends to be pretty primitive, due to impatience, disinterest, laziness, and knowing I have better things to do, as well as things I'm better at doing. But, maybe someday I'll go to the trouble of getting much better at visual art. I've rarely tried to create nice visual art since I was a child. Back then, I never had much luck drawing anything at all nice until I read a book called Drawing on the Right Side of the Brain. Will I continue being inspired to update this website? Maybe. I have a lot to take my mind off of. Here are some videos (and a picture) of giant rabbits. Yes, they exist. Happy Easter. YouTube: Really BIG Bunny - A 19-pound rabbit named Rudi. YouTube: GIGANTIC Rabbit - A 27-pound rabbit named Roberto, who is 3.2 feet long. Photo: Herman the giant rabbit. From article: CBBC Newsround | Animals | Herman could be 'biggest bunny'. 7.7 kg = about 16.98 pounds. 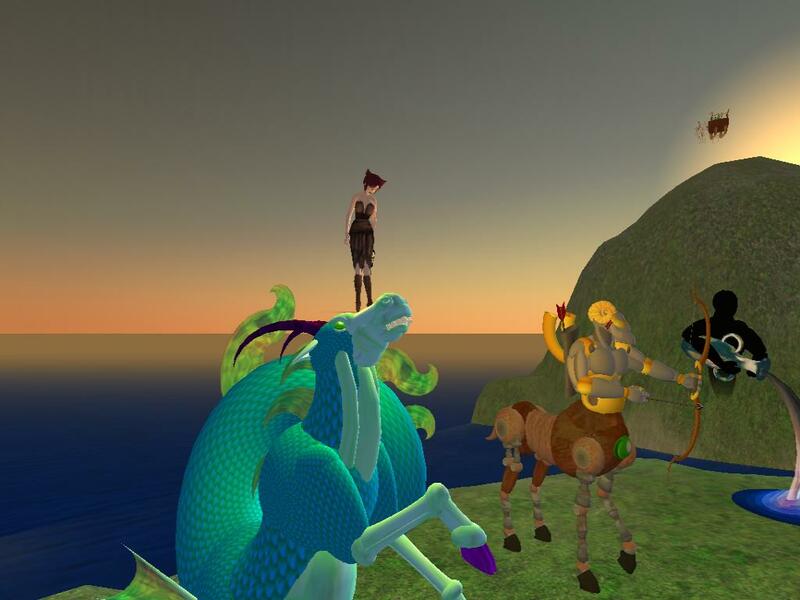 On Dec. 21, 2008 at 7:04 AM EST, sun in Sagittarius, the sign of the centaur archer, ended, and sun in Capricorn, the sign of the sea-goat, began. 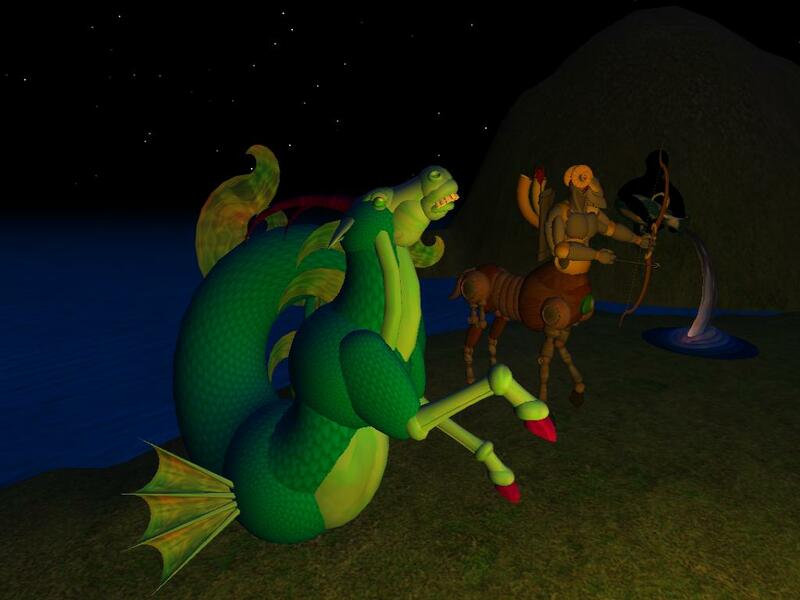 So, here are a couple more screenshots I took last March in Second Life of various zodiac sculptures at a lovely exhibit of prim sculpture art by Madcow Cosmos. By the way, here's a Capricorn compatibility tip. If you want to get along with a Capricorn, don't stand on their head. They hate that, as you can see from the picture at right. 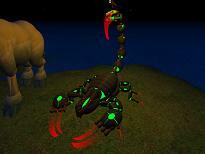 You can visit the shop of the artist, Madcow Cosmos, at the Lie sim. As of October 22, 2008, 9:09 PM EDT, the sun has begun its transit of Scorpio. 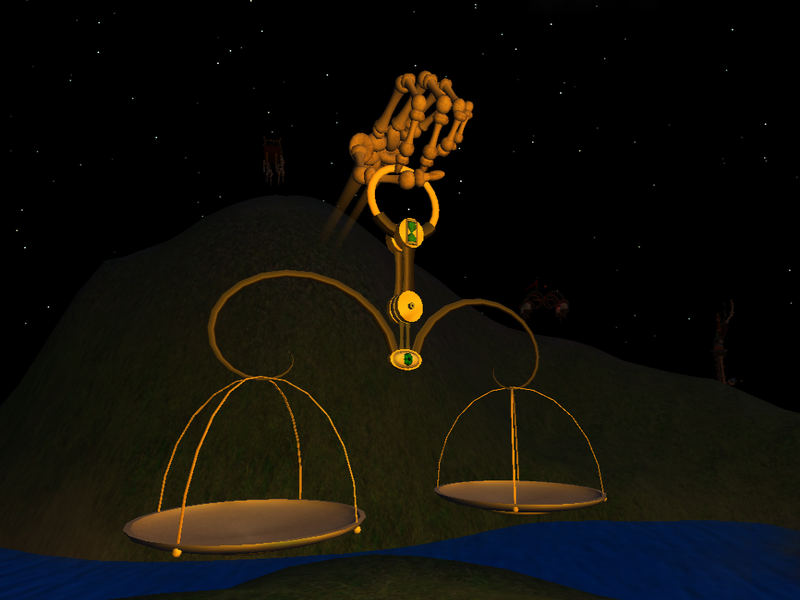 So, here's another screenshot I took last March in Second Life at a fantastic exhibit of prim sculptures by Madcow Cosmos. This is a prim sculpture of Scorpio, the sign of the scorpion (with part of Taurus, the bull, visible to the left of it). Today, the transit of the sun through the sign of Libra ends, and sun in Scorpio will soon commence - at 9:09 PM EDT, to be exact. 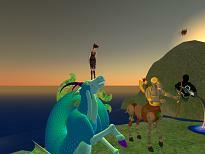 (I found this out by using the free astrology software Astrolog 5.40). 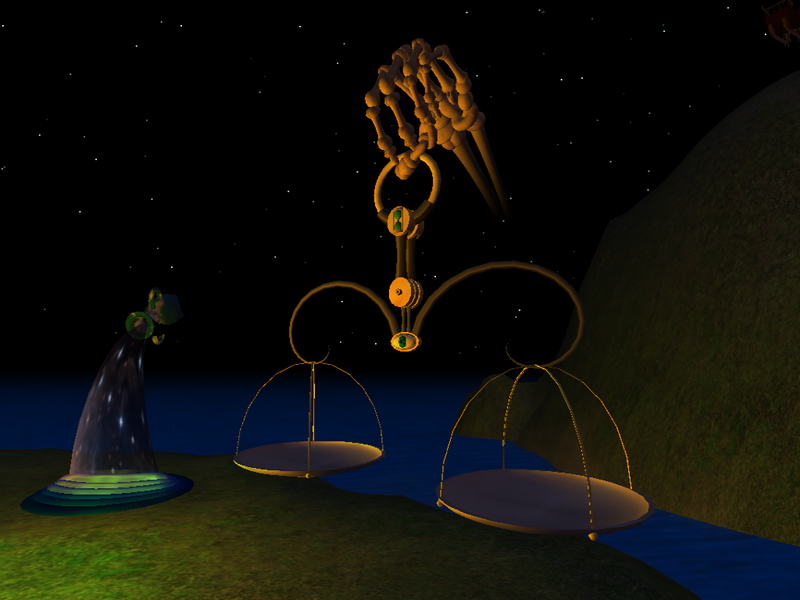 So, here are some screenshots I took last March in Second Life of a prim sculpture of Libra, the sign of the scales, at a wonderful exhibit of prim sculpture art by Madcow Cosmos. There were many other sculptures at the exhibit besides this one, and of course I took other pictures besides these - but I'm going to share them gradually, when they seem timely, or when the mood strikes me, instead of all at once.